Astavakrasana is a delightful pose for me. I couldn't even bring myself to try it for a long time because I thought it was way out of my league. I found a youtube video on how to do it and when I tried it I got it on the first try. It was a HUGE SHOCK! I sat there afterwards and was like "what just happened....did I really just do that?" I even wondered if I was doing it wrong since it just came to me. Granted its not as graceful on both sides but everyone has a stronger and weaker side. 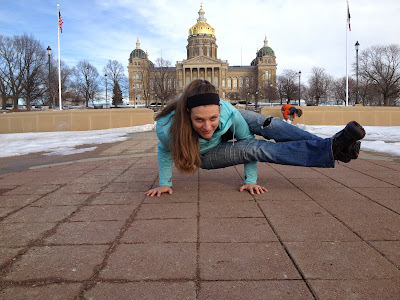 Astavakrasana is todays pose in the Humble Beginnings Yoga's Day 9 of the January Challenge. This is supposed to be a hip opener however I am still trying to figure out how since my hips feel great in this pose. My hips are such a struggle for me. Talk about tight! Astavakrasana feels like the perfect balance between my heart and my root chakra. When I find the fulcrum I can just sit there and smile. I can hold this pose the longest of all the arm balances. It was also the first pose I learned the Sanskrit word for. So why this pose? I bet everyone has a pose like this. One that just suits them from the start. I have poses I love that I may never get "just right" but I love them for that reason. Its nice to have a fall back pose and for me its Bakasana (crow or crane) and Astavakrasana (eight angle pose). When I feel frustrated I can get into one of those poses and sit and remember that I can find balance and that all is not hopeless. Then I do Downward Facing Dog to feel like I am home and Childs Pose to rest. It sets all right in my world! As for hip openers.....my hips are really sore! Which I see as fantastic. It means I did work and today I feel like they are a smidge more open. I will take a smidge! I didn't even expect that much. I do sit cross legged a lot (even though it is pretty dang uncomfortable) and when The Superhero and I are watching our nightly Star Trek I sit in semi reclined Bound Angle pose and massage my legs and try to relax. I even put one foot up on my knee when we are in the van and I stretch when we are running errands. This afternoon the Superhero and the wee fella and I got to hang around downtown while Milo and Sam were at their Home Instruction group's weekly block class. Its so nice to spend time with Archimedes. He will be going to block class as a Kindergartener in the fall. Not only did we have a great day together, I also felt pretty fantastic physicaly! We walked from the capital building down to the Historic Building and the hills felt really good. This is HUGE for me! Icing on the carrot cake....the lovely husband did a great job taking pictures for me today although I did get kind of dizzy doing the poses up on a ledge, which wasn't that high, but still made me nervous and looked really good in the pictures and thats what matters right hahaha! Whats your go to pose?